I haven’t blogged consistently over the past three months. Kim and I have done a lot of traveling and we have moved to a different state. We have had some good and bad things to deal with also that involve our sons. I may write about some of our experiences in the near future. But you can be sure we have had some good coffee along the way. Starting next week I will be posting coffee and coffee shop reviews. I have a lot to catch up on. I have even turned down some coffee until I get caught up. During our travels we have been able to try coffee in New York, Pennsylvania, Ohio, Kentucky, Tennessee, and Texas. We have had some great coffee and some average coffee. Some coffee that we had was even a little disappointing. We have been in some great coffee shops and met with owners and roasters. Talking with some of the owner/roasters was a great diversion during some difficult times. We have been learning a lot more about coffee and coffee shops too. Since January we also learned more about cupping coffees and barista judging. We plan to look into home roasting in the future too. We have been trying some new coffees and sharing beans with friends. I have introduced some people to the French Press and Chemex brewers too. 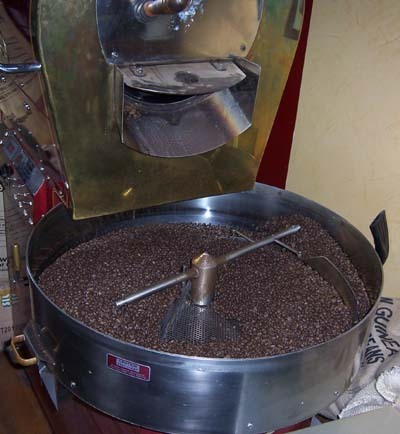 www.buongiornocoffee.net/ Venezie Blend, Grapevine, Texas; the picture at the top is their roaster. Each of these coffee shops is worth going out of your way to get too. We have had more than one coffee from each of them and thought they were very good. The staff of each was very helpful and friendly. It was a really good experience. From our point of view you should be glad if you live close to one of them. If you don’t you can still order coffee from them and give your mom some great coffee. Time for me to take Kim on a date to a coffee shop we have never been too. Until the next time, remember to stop and enjoy the conversations and coffee.